Discover the future of production and performance at your fingertips by learning how to produce and perform music with Jeremy Ellis on Native Instrument’s groundbreaking Maschine platform. 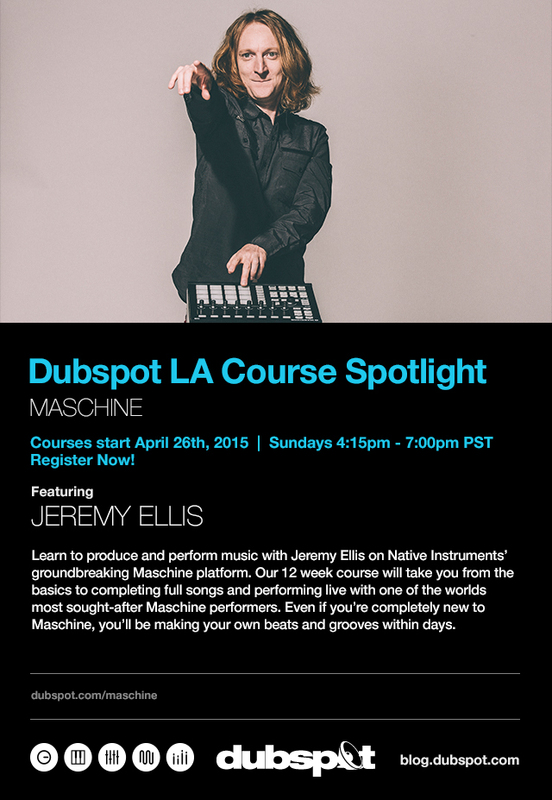 Enroll soon, courses start April 26th at Dubspot Los Angeles. Enrollment Details. Learn to produce and perform music with Jeremy Ellis on Native Instrument’s groundbreaking Maschine platform. Our 12 week course will take you from the basics to completing full songs and performing live with one of the worlds most sought-after Maschine performers. Even if you’re completely new to Maschine, you’ll be making your own beats and grooves within days. Jeremy Ellis developed as a student of jazz and classical piano and percussion, cutting his teeth in the Detroit music scene performing with Jazzhead, the jazz-fusion group that also featured Ubiquity label mate John Arnold. He has played worldwide as a member of Time:Space, and over the years has worked with Detroit producers John Beltran, Carl Craig, Recloose, and Alton Miller. Artists as varied as Bach and Chopin, Stevie Wonder and Herbie Hancock, the Beatles and U2, are his main influences. He’s an extremely curious musician always delving into new styles and picking up new tricks as he goes. Most recently Ellis has become a master of Native Instrument’s Maschine platform.